their Woodland Park tasting room. Yesterday was the first official day of Summer. This week a few breweries in town released new beers worth celebrating along with the new season. I made it up to Woodland Park yesterday to check out this new release from Paradox Beer Co. In the Spirit of Skully No. 1 had a whole new take on Summer Beer. Instead of creating a light and refreshing new project, Paradox put together this wonderful liqueur inspired Summer Barleywine. A honey, apricot strong ale fermented with a combination of 10 strains of yeast and aged in Jamaican Rum Barrels that were Jack Daniels barrels in a previous life, this beer picked up some surprisingly smooth flavors from its charred surroundings. 1. Stop by the tasting room in Woodland Park and share a small snifter with a friend on their patio. This 15% ABV barley wine was designed to be “swirled, sniffed, and slowly savored.” Also, while you’re there be sure to take in their other exciting projects. 2. Pick up a bottle to take home. 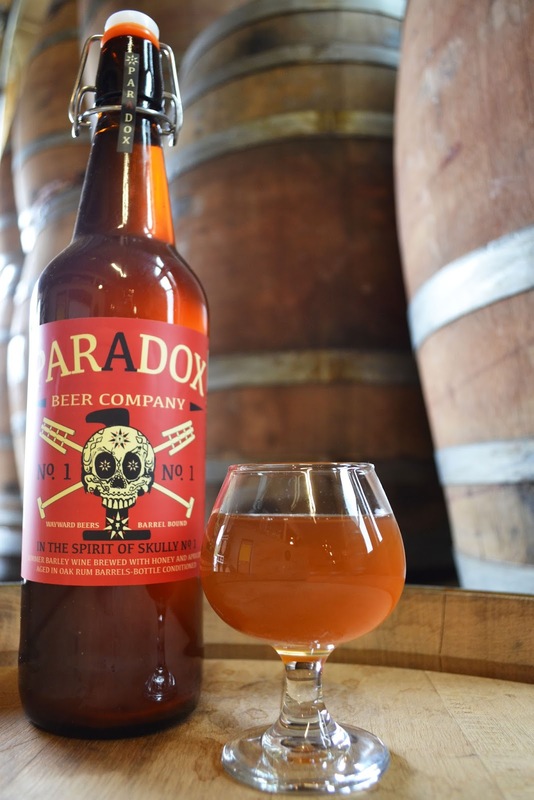 “This one is so young, it hasn’t even fully carbonated yet,” said Jeffrey Airman of Paradox Beer Co. The honey in this beer will only help it smooth out and lose its slightly hot alcohol fusels more and more over time. Open it and enjoy on the first day of Summer next year, if you can wait that long. TRiNiTY Brewing Co. made their cucumber saison again this year, and it was released yesterday on tap and in bottles. “It’s refreshing!” ring customers as they try their first drink. This time around they mixed up the recipe a bit. The first batch still had the rind on the cucumber and tastes more similar to last year’s version. However, on the second batch of Elektrik Cukumbahh, they peeled the 24 lbs of cucumber per barrel before adding it to the beer. The first batch was bottled, the second batch kegged. So, if you try the kegged and bottled versions next to each other you might notice a grassier finish out of the bottle as opposed to a more citrus finish when poured out of the tap. Raquel from Trinity says this cucumber saison should be on tap for a week or two because they were able to keg a lot more of it than last year. 1. Grab a glass of this beer Wednesday during lunch and take a seat at one of the outside picnic benches amidst their planter boxes. 2. Tweet up any questions you have for Trinity and Jason between 1-2 pm on June 26. 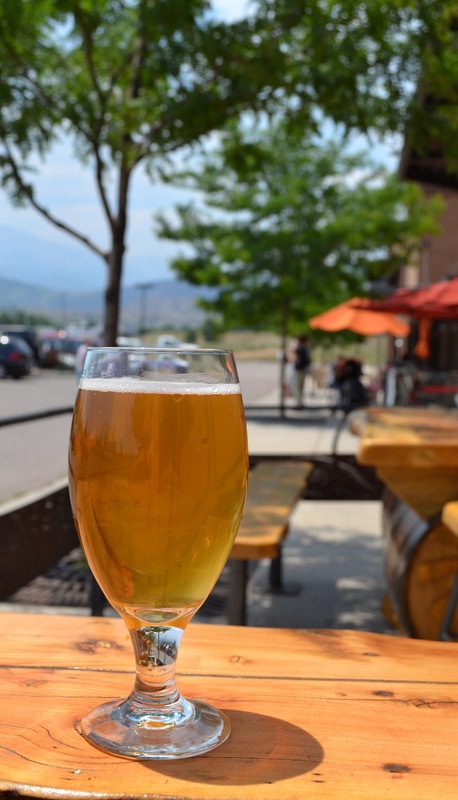 Trinity Brewing will be featured for this month’s tweetup with the Colorado Brewer’s Guild. What better time to enjoy their beer than when you can help a Colorado Springs brewery get their name out on the interwebz? Here is a link to the Facebook Event Page for more information. Great Storm Brewing’s Sunshower Strawberry Blonde, perfectly garnished for the season. 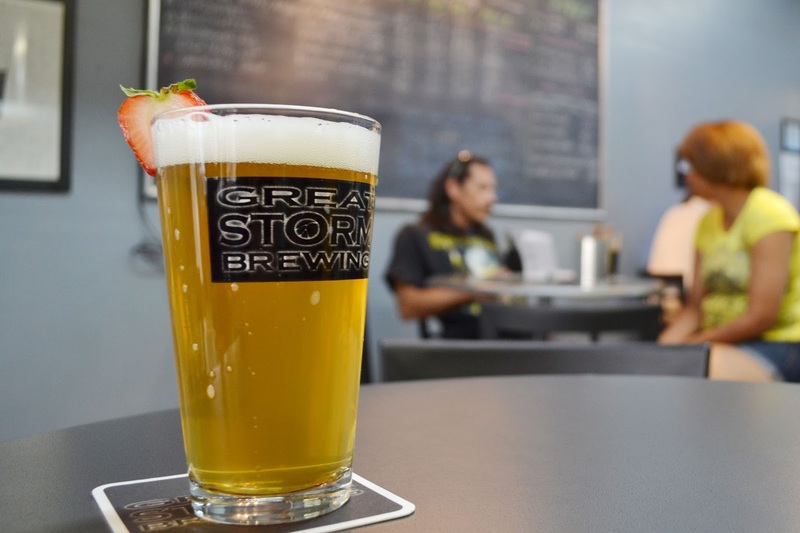 Great Storm Brewing released three Summer Seasonals on Wednesday. People packed their small tasting room and patio to try these limited release beers. Live music, a food truck, and one of their biggest crowds made it a festive occasion. There were two returning favorites, Sunshower and Midsummer Ale, and my personal favorite, Ornithopter. Sunshower Strawberry Blonde is hands down the most popular of the three. It’s a quintessential Summer Beer. Sunshower is light, refreshing, with just a hint of strawberry. “Until they run out, that’s what I’m drinking,” said a regular at the bar. From the looks of how many order this strawberry garnished beer, that will be sooner than later. Midsummer Ale is a citrusy, light, golden ale with Bohemian Lager yeast. For every batch they zest six each of lemons, limes, and oranges. For me, this beer was more sweet than tart. Great Storm isn’t planning on brewing Midsummer Ale again this season, so if you like a balanced citrus beer then I recommend getting it while it’s still available. Ornithopter, a new release this year, is a take on a German style that was made before the purity law Reinheitsgebot took effect. Bevan of Great Storm brewed this beer with molasses and honey to bring a taste of the traditional style to Colorado Springs. Contrary to what most of their customers are ordering, I feel this was the best of the Summer beers released. 1. Go in to their N. Nevada brewery and take advantage of their smaller pour options to get a taste of each of these new releases. 2. Get your favorite of these in a growler-to-go and bring it to share with friends at your next BBQ. These pair perfectly with a competitive game of corn hole and hot summer days.